So I have loads of different things that I want to share with you guys from this trip, and more from LA & Verona so please just bare with and also, sorry if they’re not in order. I want to share not only the outfits I wore because, duh, but also what I learnt because there is so, so much that I learnt and of course there were only around 200 influencers from around the world at the reward style conference, predominantly America, which means all of my amazing friends and fellow bloggers don’t get to hear the incredible tips and speeches I did. It’s only fair that I impart some knowledge right? Ok so what we have here is me arriving in a hotel room, noticing the big mirror with impeccable selfie lighting and legit, not even putting my handbag down before I get the shot. 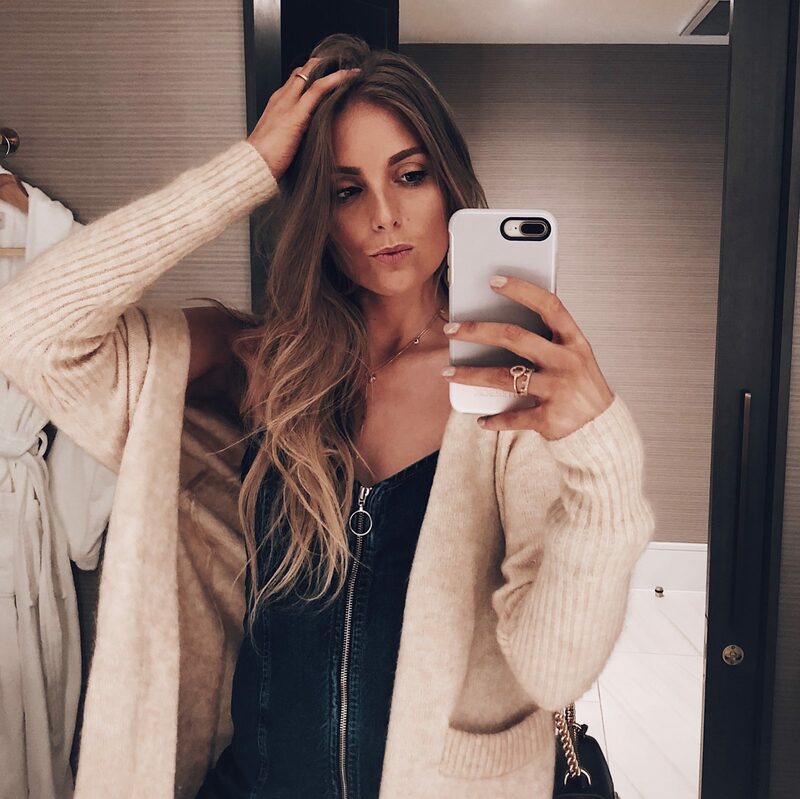 A blogger’s like a moth to a flame when it comes to a good selfie mirror and I already knew the Reward Style conference was gonna be a good one when I’d got a good selfie under my belt within the first 5 minutes of arriving. No I’m not that extra that I actually changed to check into the hotel, can you even imagine having that many outfit changes? We had a checking in for the conference itself where we all got our personal itinterarys which included lessons and one to one meetings with brands which were all pre selected and matched to our personal needs. 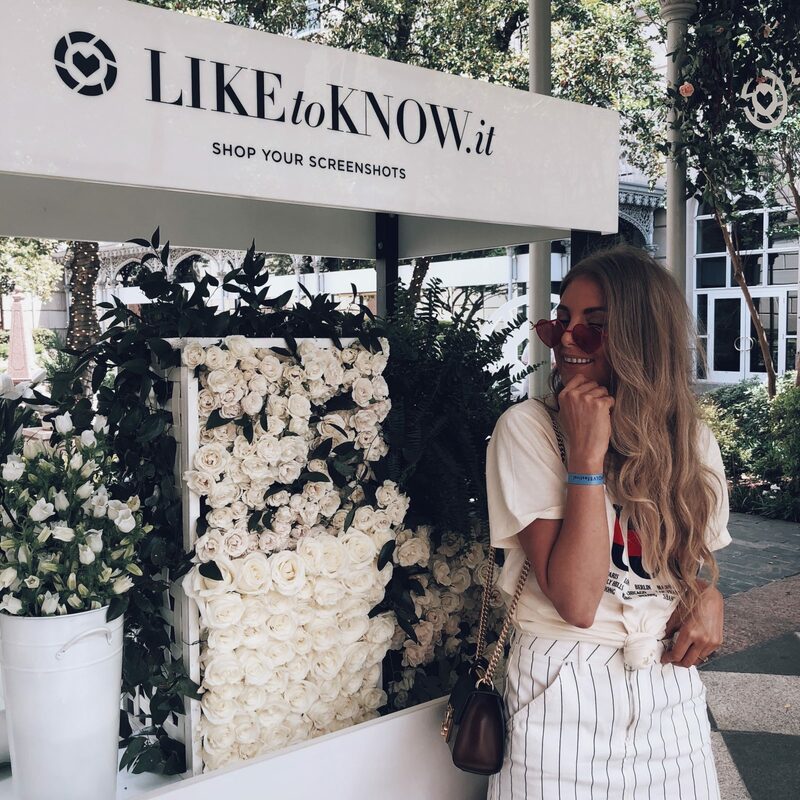 I managed to snag a cute picture in front of the iconic liketoknow.it icon which just so happened to match my outfit perfectly! I actually got this skirt in a size 10 because I didn’t want it to be super tight but I will say that it’s stretched a lot and does feel fairly loose now which inevitably makes it longer. I still love it but a word of warning to go for your true size! The first party of the weekend and all of us British girls could barely keep our eye open from some major jet lag. I wore this super cute Tularosa dress again, the one that I wore on the first day of the Revolve Festival, but it did have a bit of burger sauce on it. Nothing a cleverly placed pleat won’t sort. I had originally planned to wear this amazing Privacy Please purple polka dot dress that I actually did wear in LA here. It’s just so big for me on the beast area in particular that I just didn’t feel comfortable in it! I’d definitely say to size down and in my case I’m just going to get my sister to run her sewing machine down in, she doesn’t know it yet. So it’s officially day 1 now and the conference is kicked off with some incredible speeches from the founder of Reward Style, Amber , Kendra Scott who we all agreed should be doing some form of TED talks because if that woman is one thing it’s inspirational, Aimee Song and a panel of brands. So interesting and super exciting but I will 100% be going into that in more detail on my blog tips posts to follow! After this we had a lovely garden lunch with Banana Republic and I opted for this little gingham dress from Topshop you might well have seen on my Spring Topshop Haul! I was actually a tad chilly – legit gutted that meanwhile in the UK they were having a heatwave – so i whipped my denim jacket on and my little Chloe Faye mini which I have been neglecting recently! It’s so cute for summer though! I went all out for this. I mean not all all out, but me all out. I’d already pre selected a little black dress from ASOS when packing because I knew I had certain events on and needed to make sure I was well equipped! It’s actually meant to be bardot but I kind of love it with the puffy shoulder situation, even if it does make me look like Gru from despicable me! I’d also put my hair up to do my make up and the lovely Lucy managed to convince me to keep it up and judging from the likes and comments on it I’d say that you guys like it too! This was a super fun mexican themed cocktail party with Margaritas flowing held by Express, an american brand I hadn’t come into contact with before but they definitely have my attention after a corker of a party! For day two we had chocker block meetings and lessons, broken up by a lunch uptown with Sole Society. Another American brand I’d not known much about before but after checking out my goody bag I’m going to have to pay attention to what they’re up to! I assumed just shoes but I got the cutest bag and a scarf that honestly I just want to rub on my face all day because it’s that soft. For this I wore a pretty random outfit. 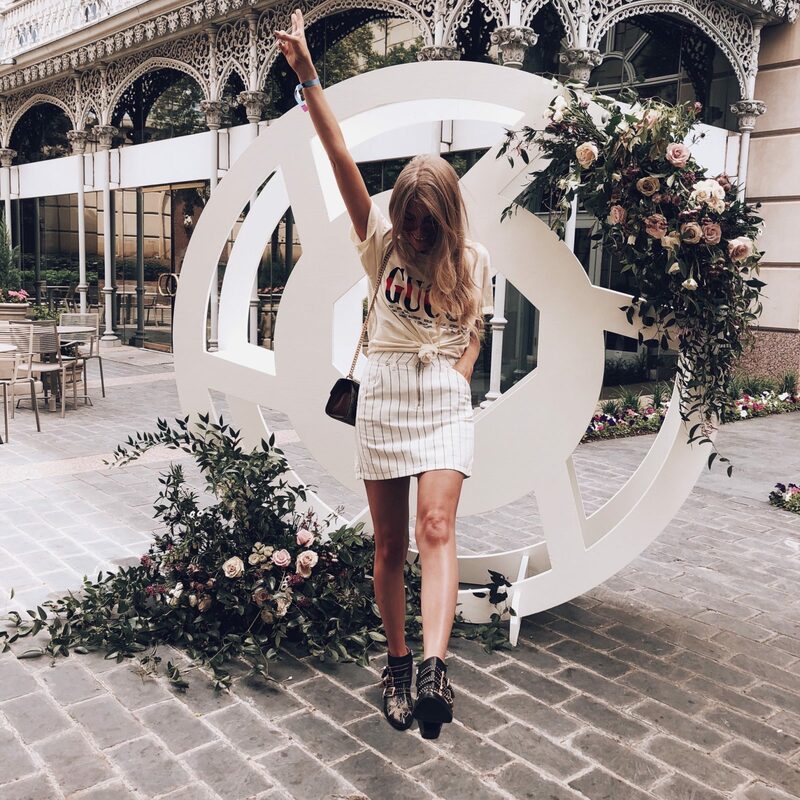 My day 2 outfit was my Topshop denim skirt, remember I told you not to size up on that one, and a top I also got from Topshop but didn’t quite manage to shoot, I’ll link it here so you can have a look! But actually it was raining on this day so whilst waiting for the bus, I made the decision to peg it back to my room in search of layers. Can you believe I’m over there in Dallas with a jumper on and you guys were all sunbathing mid heat wave? And finally, the finale! A beautiful garden party that actually was underneath a tent for the entirety as it started to rain pretty damn heavily!!! It was super fun with robot break dancers, crazy sax players and all of the snacks. So many snacks, no t enough time. It was so lovely to bring to an end an amazing weekend of so much information I think my brain is about to burst with ideas! And I’ve got to hang out and spend time with some lovely girls! Wow! I am so in love with your bicycle outfit, the gingham dress with a denim jacket looks very fine! Bicycle fashion is very important, as you really need to think over what to wear for a ride, as noone wants to shine their asses while riding the bike, am I right?! 🙂 I personally prefer to wear skorts, shorts, or jeans. 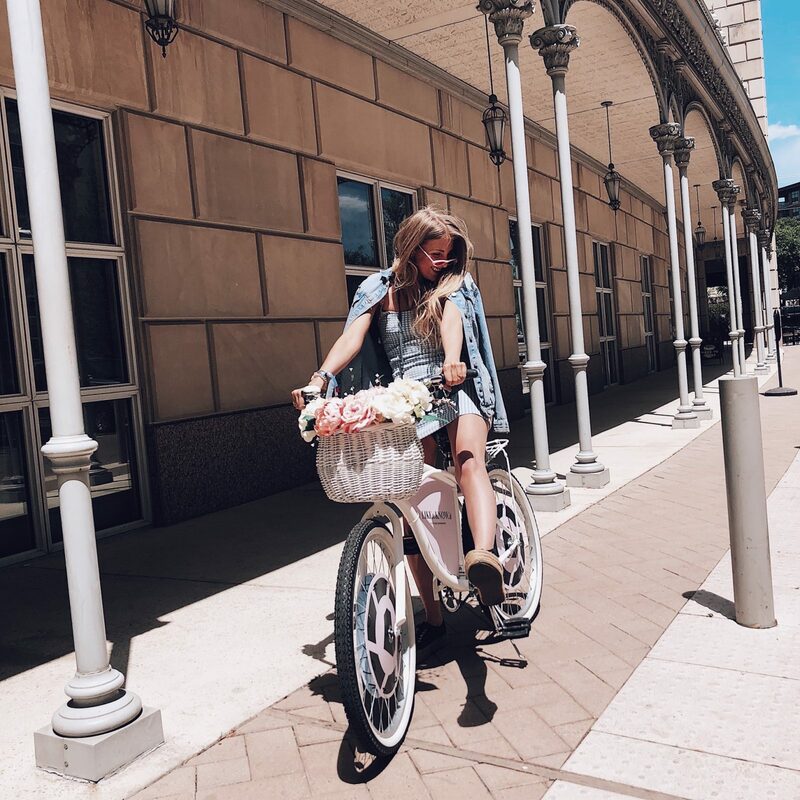 I have a post about bicycle outfit ideas to wear this 2018, check it: http://standoutlook.com/what-are-the-best-2018-fashion-trends-for-riding-a-bike/ hope you like my ideas. Overall, thanks for your post! Babe I have to be honest, I didn’t ride the bike I just took a photo on it!